Photos are from the NYC Women's March, January 20, 2018. 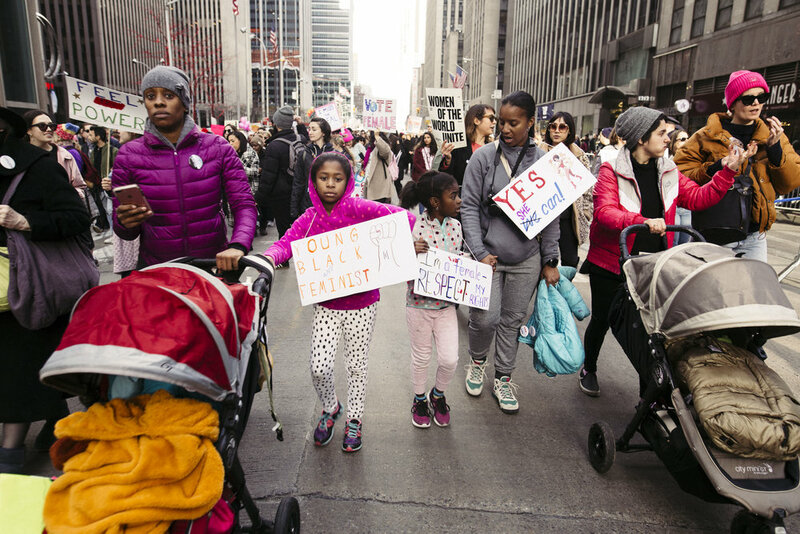 In the aftermath of the election, womyn came together and wanted to fight back. We seized our power last year at historic Women's Marches. As the year went on, we came together and opened conversations about our shared experiences that opened up new paths toward gender justice. At this year's Women's Marches, across the country, the message was clear: That's how we take our political power back, too. Criticisms of the Women's Marches are important. The seas of white womyn holding signs denying their role in the current political climate, womyn espousing trans-exclusionary feminism, and men carrying “not all men” signs at the marches this weekend are proof that this movement is not perfect. It’s time to center womyn who aren’t white. It’s time to center queer and non-binary folx. It’s time to listen to those who were fighting long before us. Fellow womyn of privilege: for real, now is the time to do more and speak less. Remember when you say #metoo that our queer and trans siblings are statistically more likely to be assaulted. Remember that when we talk about access to abortions we are also talking about access to cancer-screenings, hormones, and essential life-altering medical care. Remember that when we talk about the wage gap, white womyn are still paid higher than womyn of color. Remember that when we stand up for womyn, we’re standing up for all womyn. And remember that when you show up to march you’re there to show people around the world that you are prepared for battle—and that you stand in arms with your comrades. Until we’re all lifted up, the patriarchy wins. The only way to win is to keep fighting—together, and with and for each other. And guess what! It’s a great year to fight. It’s a midterm election year. We can march ourselves right to the polls and make a difference. You don’t need to quit your job to change the world. If your mom or co-worker or boss or enemy went to the march and doesn’t understand why their sign was trans-exclusionary, or why white women can’t be centered, gently discuss it with them. Note: Please don’t yell at them or write comments on their Facebook. It is so much less effective than a nice conversation. It's on all of us this year, and especially those of us with the least at stake. We can’t keep relying on marginalized people to come save the day when we screw everything up. Let’s get behind them and lift them up. Amplify their voices. What could come of this power—should we choose to harness it, cultivate it and sustain it together—is a radical chance to begin sewing solutions where now there is only discord.